John Fogerty celebrated a birthday over the weekend, so Creedence Clearwater Revival have today's intro tune . . .
Worldwide sales of electric vehicles jumped by 54 percent last year, but current and planned policies won't achieve a multilateral climate goal of 30 percent of new vehicle sales by 2030, the International Energy Agency said in a report Wednesday. Why it matters: major progress in electrifying the transport sector — passenger cars but also trucks, buses and other transport — will be vital to achieving very steep greenhouse gas emissions cuts in the coming decades. But, but, but: the IEA report looks at current trends against what would be needed to reach the collective 30 percent by 2030 goal — called EV30@30 — set a year ago by the Clean Energy Ministerial, whose members include the U.S., China, the EU, India and over 20 others. Check out the chart above: The report notes that under the EV30@30 goal, there would be 228 million electric vehicles on the roads worldwide — mostly passenger vehicles but also including so-called light commercial vehicles, buses and trucks. That's around 100 million vehicles more than under the "new policies" scenario, which models existing and announced policies and shows they will fall well short of the target. Where things stand now: EV sales surpassed 1 million vehicles in 2017, with China leading the way and accounting for more than half of all sales as EVs reached a market share of 2.2 percent. The worldwide number of electric cars grew to over 3 million last year, and 40 percent of those are in China, the world's biggest auto market that's expected to see steep growth in years ahead as the central government bolsters support. Sums it up: the Financial Times starkly describes Canadian PM Justin Trudeau's move to expand the market for oil sands . . .
"The Canadian government has taken a radical step in its attempt to increase the country’s oil export capacity, agreeing to buy the Trans Mountain pipeline from Kinder Morgan of the US for C$4.5bn," they report. State of the market: crude prices have tumbled several dollars in recent days, but they're inching back upward again this morning. Reuters explores why . . .
"Oil climbed towards $76 a barrel on Wednesday, supported by tight supplies despite expectations OPEC and its allies will pump more in the second half of 2018 and helped by forecasts U.S. inventories fell," they report. U.S. challenge: "From West Texas pipelines to Oklahoma storage centers and Gulf Coast export terminals, the delivery system for American crude is straining to keep up with soaring production," Bloomberg reports. Axios' Amy Harder reports that Chevron faces two votes on non-binding but symbolically important shareholder resolutions on climate change at the company’s annual meeting today. The context: The votes are the latest in a string of climate-related resolutions being pushed at energy companies in recent years, as shareholders seek more disclosure of climate risks and more aggressive steps on low-carbon energy. Check out the chart above for some of the recent action. One resolution asks the company to detail how it can do more to cut emissions of the potent greenhouse gas methane. What we’re hearing: The methane resolution is likely to pass the 50% mark because similar votes have passed at other companies. Getting this support likely indicates company adoption of whatever the non-binding proposal calls for. The other vote is unlikely to pass, according to Danielle Fugere, president of nonprofit As You Sow, which filed the resolution on behalf of some Chevron investors. This is in part because it’s going a step further and asking for strategy change. We've got a bit more in the Axios stream. Solar and climate: over at UC-Berkeley's Energy Institute at Haas, professor Severin Borenstein picks up the debate over how much the goal of optimizing cost-effectiveness should drive low-carbon deployment policy, given the urgency of the climate problem. Why it matters: It's a question pushed to the forefront by California's new rooftop solar mandate, and Borenstein — a critic of that policy — warns against what he calls a "try everything" approach that he argues is counterproductive. "Leadership and technology development should play central roles in the debate on climate policy, along with economic costs and benefits. But those claims should not be given a free pass any more than the ones that can be quantified more easily," he writes. China and trade: a Center for Strategic and International Studies analysis looks deeply at the potential for growing U.S. energy exports — especially oil and gas — to China to play a major role in balancing trade between the two countries, a topic we explored here. Related: via Bloomberg, "China is considering a plan to buy more American coal as part of an effort to narrow its trade deficit with the U.S."
EPA policy: per Reuters, "A coalition of ethanol and farm groups sued the U.S. Environmental Protection Agency on Tuesday, challenging its decision to free three refineries, including one owned by billionaire investor Carl Icahn, from annual biofuels requirements." 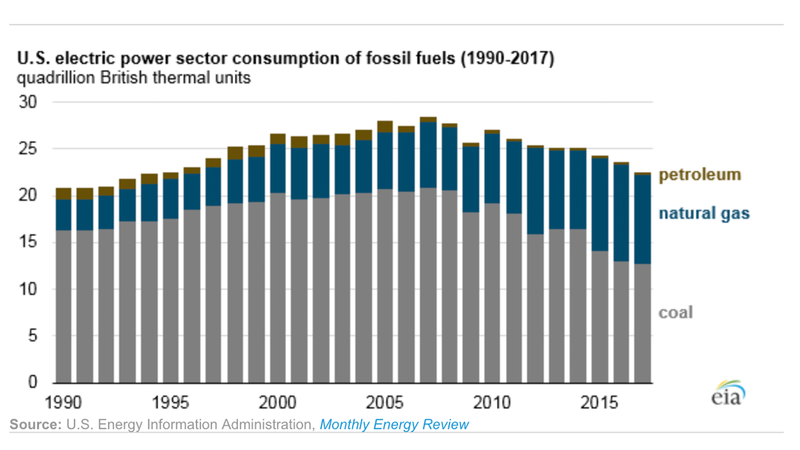 We're having a 90's moment: fossil fuel consumption in the U.S. electric power sector fell to its lowest level since 1994 last year, the Energy Information Administration said in a short report. Why it matters: the chart above tells the story of the seismic changes in the country's power sector as efficient, combined-cycle natural gas plants have displaced coal and older, less efficient gas plants. There has also been significant growth in renewables. One interesting milestone: "By the end of 2018, natural gas combined-cycle units may surpass conventional coal-fired power plants to become the most prevalent technology for generating electricity in the United States," EIA notes.